This d ebut novel from Malachy Tallack follows the old adage, ‘Write about what you know’. Raised in Shetland, and author of two previous non-fiction books about the island, Tallack is uniquely positioned to tell the story of life in a remote Shetland valley. The narrative, told from several points of view, follows the intertwining lives of the islanders. David and Mary are the parents of Emma, who lives with her boyfriend Sandy. After Emma leaves the relationship, Sandy is left in the awkward position of renting alone from Emma’s parents and trying to forge a working relationship with David as a crofter. Alice is writing a book about the valley following the death of her partner and becomes intrigued by the life story of elderly resident Maggie. A quick web search of the author uncovers his musical side, performing as a singer/songwriter, and reveals a home video of the self-written song, “This song is for you”. 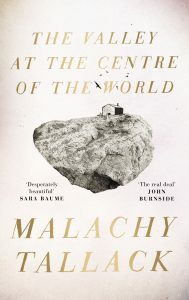 Tallack modestly sings: “You know I’m not that good at turning into words, the things that I really need to say.” Fortunately, this sentiment is self-deprecating; The Valley at the Centre of the World is beautifully written and the musicality of the author pervades the novel. The Shetland dialect spoken by the locals bounces about the page like a jaunty French sailing song. The simmering tension of the relationships are full of sustain; a pedal note rising slowly to a climax that, in truth, doesn’t satisfy the curiosity and anticipation created by Maggie’s seemingly mysterious past. The characters deal with the most fundamental of human fears and desires: grief, longing, regret and love. Mary in particular struggles to come to terms with ageing during a conversation with David: “’Sometimes I just wake up in the morning and I feel sad. I think about sad things.’ ‘But du dusna regret bein here does du?’” Mainstream culture and politics tend to focus on stories of city life, so it is refreshing to hear these emotions from the perspective of islanders whom Tallack has given a voice. The dialect might be off-putting to some (particularly non-Scottish readers) but it sharpens the lens of realism in the novel and helps to authenticate a more immersive experience for the reader. Tallack has created an incredibly detailed and realistic window into human emotion. He holds up not a black mirror, but a looking glass in which we can delve deeper into our own understanding of life. We see that island life can be both achingly beautiful – Mary needing her garden to fulfil her motherly instincts, now that her children are fully grown – and painfully dull: a detailed chapter of David and Sandy draining a field. And, like real life, the story finishes with loose ends which have not been sewn up but left frayed at the edges, untidily unresolved. Despite the slow pace, the quality of descriptive writing will guarantee that you will want to visit Shetland. Absorbing, but not gripping, The Valley at the Centre of the World will transport you to a place you may have never visited, and will challenge your understanding of what a novel should be.